may be in combustion air rising up the chimney. Sulfur is in soot deposits from a coal fire. Damp creosote in the flue has a sour, sickly smell. Warm weather, rain, high humidity tend to increase the strength of the odor. lt's always there in your chimney, but you don't usually notice it during the heating season. ln winter the draft helps carry the smell away and the flue also stays drier. But in summer, downdrafts (f low reversals of the air in the flue) can send the odor into the house. Cleaning out the creosote or soot may help eliminate this smell. Many sweeps also use a special deodorizer. Next, a chimney cap should be installed to keep out birds, animals, leaves, rain and snow. 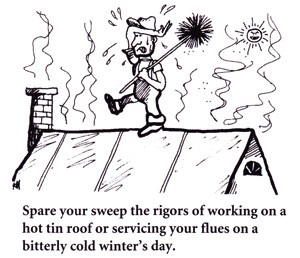 Your sweep may need to schedule a second visit if he or she finds that your heating system needs additional service. Chimneys should be inspected yearly. Deteriorating mortar and missing or broken bricks and missing, broken or cracked flue tiles should be replaced. A harmless looking hairline crack in a tile flue liner will open up under high temperatures. Escaping heat and flame could set your house on fire! Sweeps who video-scan flues can provide photos of damage or defects. Many chimneys need to be lined or relined. Damage from a chimney fire or the deterioration of the years may mandate that your flue be completely relined. High-quality rigid or flexible stainless steel liners are available for this purpose. Most professional sweeps have been trained in the necessary installation techniques. Cast- in-place liners are also available and can be a good choice for a weakened, oversized chimney. lf the date of a chimney fire can be determined, and there was a witness, homeowner's insurance might pay for relining the chimney. Many sweeps work with insurance companies on a regular basis. They are accustomed to supplying documentation of the damage, as well as estimates for rebuilding, repairing or relining a chimney. A stove or fireplace insert may have been incorrectly installed. These are like time bombs, ticking away, threatening your home and family. Sweeps frequently find that the stove's floor protection or clearances to combustible materials are less than the installation instructions or codes specify. The connector pipe may need to be replaced. Sections should be screwed together so they cannot rattle apart and spill burning creosote onto the floor if there is a chimney fire. lf you have converted to gas fuel or replaced your furnace with a high or mid-efficiency gas unit, your chimney should be swept to eliminate possible blockage. lt will also need proper vent pipe installed, something service companies often neglect to do out of sheer ignorance. A gas furnace should never vent into an unlined masonry chimney. Excessive moisture and acids in the flue gases can destroy it in a few short years. ln addition, sluggish draft in an oversized flue can cause poisonous carbon monoxide fumes to spill into the house. The installation of a gas furnace should not be left to amateurs or to behind-the-times professionals. Many sweeps are dreadfully overworked in autumn. They must turn away customers or put them on hold until late winter or early spring. Don't be surprised if your sweep raises his prices in autumn. He may offer dis- counts now to avoid those hot summer roofs and even out the workload. Reprinted, with permission, from the March 2011 issue of The Chimney Sweep News, an independent trade magazine for chimney service professionals. Jim Gillam, editoripublisher. 541-882-5196.